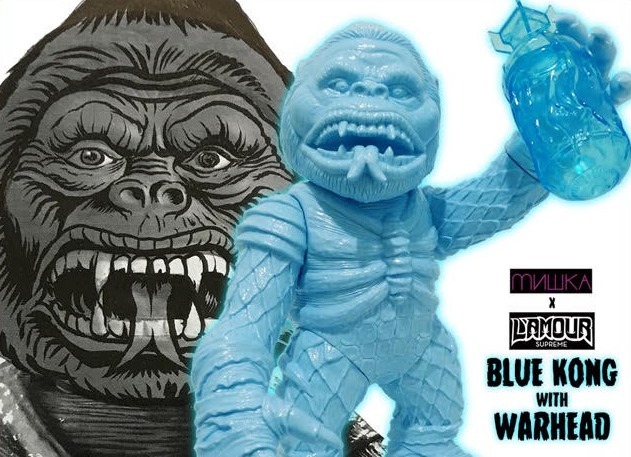 BlackBook Toy is set to unleash the newest evolution of their long running collaboration with Mishka and Lamour Supreme: Kong. Kong features a brand-new raging gorilla head attached to The Beast body. Designed by Lamour Supreme and sculpted by Kenth Toy Works, the Kong head sculpt features a forked tongue and Keep Watch-style emerging eye on the back. BBT will debut Kong in an unpainted light blue edition at WonderFestival Winter (2.10) in Japan (N-Plan Booth: 7-21-04). In a bit of a reverse order drop, they are offering Kong to overseas collectors before the WF debut in Japan. And… they are throwing in a free, bonus Hologram Warhead. Quite the deal since the OG painted Warhead sold for $49 each. To celebrate the age of Kong, BBT is releasing the Blue Kong with free Hologram Warhead (clear blue) for ¥17,000 (~$155) via email lottery for collectors outside of Japan starting on Wednesday (2.6) at 7 AM and ending on Friday (2.8) at 6:59 AM. To enter drop a line to [email protected] with the tile of "BL Kong Lottery entry' and be sure to include your name, full shipping address, telephone number and also mention you want the Blue Kong + Warhead. Full lottery info is available from BBT. Finally, wondering about the Mini Kong and Mini Beast finger puppets (pic after the jump)? These will be available at WonderFest and are larger than the typical finger puppet toys (3.5", ¥1300/~$12). First released at Toy Soul in Hong Kong back in December, the KD-Harigon Milk edition from Teresa Chiba and adFunture celebrates the legendary HK magazine with a white, gold, and clear vinyl design. This blend of Chiba's signature character and Keios' three-eyed Kayden mascot is quite striking in person—refined and sophisticated. The KD-Harigon MILK edition soft vinyl (3.5") is available now directly from adFunture for $75. Big Boys Toys is celebrating the Lunar New Year which began on Tuesday with the SC Braver Chinese New Year Edition vinyl. 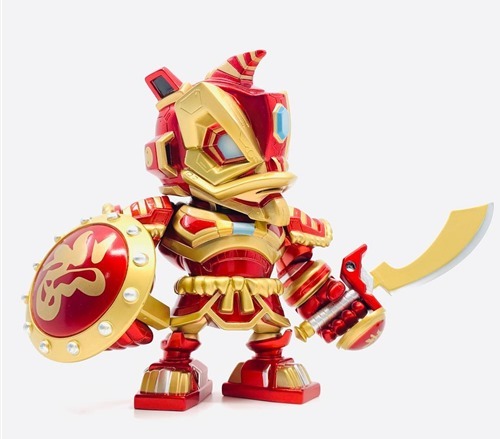 Featuring the traditional red and gold colors, this edition of their new Mecha meets Lion Dance figure stands almost 6" tall and features a striking 11 points of articulation. Big Boy Toys is currently offering the SC Braver CNY edition via email lottery ending at 7:59AM PST on Sunday (2.1) for $89 each. To enter drop an email to [email protected]bigboystoys.com.hk with a subject of "SC Braver CNY version Lottery sale" and be sure to include Your Name, IG/FB Name, your country, Shipping Address, Phone Number and Paypal email address. Gary Baseman has a sweet treat for collectors and their loved ones. 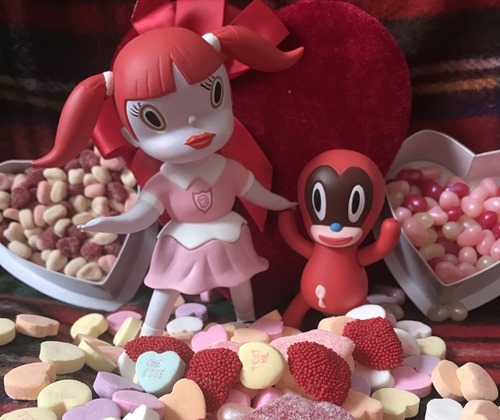 His Exclusive Wildgirl Veronica Red vinyl set (3DRetro) features a red-headed Veronica in pink skirt, hand-in-hand with a cute red Chou Chou. The set also includes a playful bonus print. A sweet Valentine's Day gift, the Exclusive Wildgirl Veronica Red + print set will be released on Tuesday (2.5) at 10 AM PST from the artist's web store. Nathan Jurevicius will soon be releasing a new glass owl sculpture (edition of 30) in a lovely pink edition. 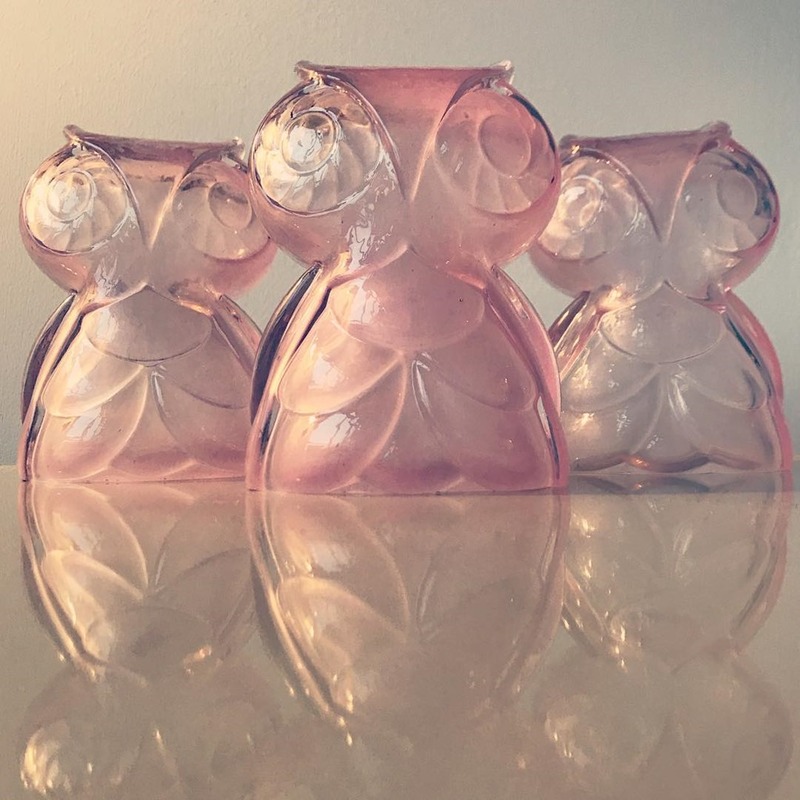 While details are short at this point, these were crafted in Målerås, Sweden which is also where the Ikea Art Event 2018 glass collectibles were made. This appears to be a different sculpt from his Ikea Sutemos piece. For the latest, be sure to follow Nathan on Instagram. Unruly Industries is an exciting new Art Toy-focused brand from none other than Sideshow Collectibles. Look for original and pop culture licensed vinyl art toys from a talented lineup including Jesse Hernandez, Tracy Tubera, Joe Pulido, Psuedo5 and T Wei. 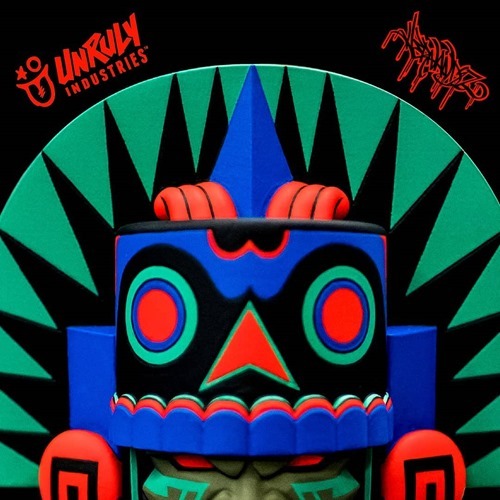 To start off 2019, Unruly has just teased the return of the Jesse Hernandez's fan-favorite Mictlan in what looks to be a brand-new color scheme. Award season beckons again. The Designer Toy Awards are now accepting nominations for this year's celebration of the best and brightest the art toy industry has to offer. Head on over to the DTA site to nominate the toys and artists that you feel are most deserving in the full-range of categories (toys, artists, stores blogs, and more) before the deadline of February 28th at 3 PM PST. Toys, artists and companies that were released or actively awesome in the 2018 calendar year are eligible to be nominated. Let your voice be heard. Blown away by a toy or artist in 2019? Nominating them for a DTA is the first, essential step in getting them recognized at the DTA Awards Ceremony on June 1st in NYC. 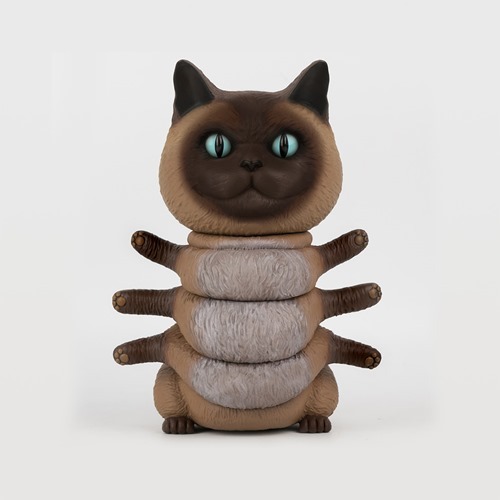 Tenacious Toys has announced their Exclusive Siamese Kittypillar by Casey Weldon and 3A. The new version of Weldon's quirky, fun figure mimics the appearance of the Siamese cat with the 'pillar transmogrification. Limited to 100 pieces, the 8" Siamese Kittypillar vinyl is available for pre-order now from Tenacous Toys for $90. En route from China, these should ship out to customers in March. A little than two weeks ago, Whereschappel dropped his take on Mickey in ninja fashion with a simple IG announcement without the fanfare of a set release date. To no one's surprise, the 12 piece edition insta-vanished. 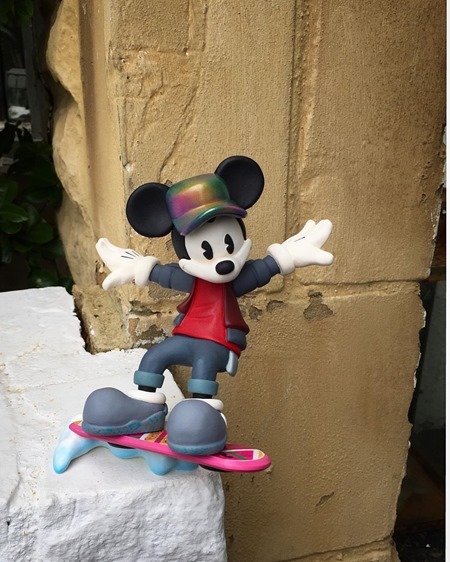 Now, he's just posted a pic of his new Mickey McFly, an awesome 2x pop culture special with a wintery twist. When? 'Coming Soon'. Time to stay glued to his IG page? Just might be.